Every week we pull together some great Canadian recipes from Canadian food bloggers around the web featuring one main ingredient or dish. 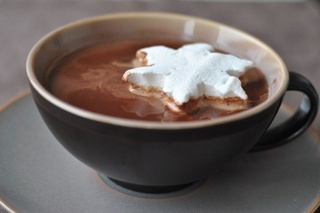 This week our collection of hot chocolate recipes will keep you (and your hands) warm! When it's being Canadian outside (i.e. snowing, freezing etc) nothing beats coming inside from shovelling snow in the cold and being welcomed with a big, steaming mug of hot chocolate that warms your heart and your hands. This collection of hot chocolate recipes has everything from a decadent Salted Caramel Hot Cocoa to Belgian Hot Chocolate with Butterscotch and Whipped Cream (oh my!). There's a dairy free vegan version, a hot cocoa mix you pre make and even gift to somebody who spends their days outside in the cold and there's even a slow cooker hot chocolate! Whichever one you make, these 9 ways to make hot cocoa are all sure to warm you up and make you feel snug as a bug! Delicious hot chocolate! Thanks for the feature! These all look so wonderful! Thanks for featuring my drink!